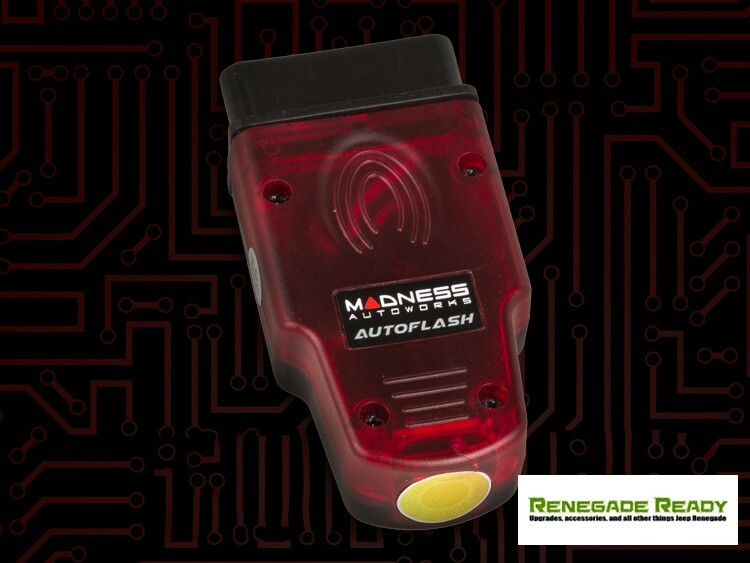 Increase performance with faster gear shifts on your Jeep Renegade with the AutoFlash by MADNESS! The MADNESS AutoFlash relies on updating the maps of the TCU to allow the gearbox to improve shift times and bypass the torque limiter. As always if you have any questions please do not hesitate to give us a call. for a large selection of Jeep Renegade Parts and Accessories in stock at the lowest prices. We service, customize and modify! Give us a call (Toll Free) 888-993-7552 or 562-981-6800. Email us: To view links or images in signatures your post count must be 0 or greater. You currently have 0 posts. The Autoflash is a great match with my Go Pedal the Autoflash made a dramatic change in the quickness of the shifts and when the RPMs runs up the power ban it shifts from one gear to the next smooth an crisp. Compared to stock its quick. Less hesitate from shift to shift and how you D press the gas pedal the RPM range will shift at the appropriate rpm even at a higher RPMs your shift is smooth and crisp. The Autoflash is a great addition to your Renegade by itself it will work perfect. If you pair it with the Go Pedal the package is awesome. Overall, I’m impressed. The vehicle shifts a lot smoother and holds RPMs much better. It is true that this tune required a little bit of breaking in. It was only moderately noticeable after the drive home but after driving to work the next day you can really notice the difference in how the transmission functions. I would say the change of performance is best characterized by giving your vehicle a Red Bull – or like energy drink. It’s just peppier and drives a lot smoother. It almost feels like the 0-60 time is faster than it used to be. If this is only a TCM tune I can’t imagine what a full ECU tune would be like. Please let us know if you have any questions about the Autoflash! So if my primary issue with my Renegade is the lag time it takes to drop a few gears and accelerate in traffic, am I better off getting the AutoFlash or the Go Pedal? from product page: "Please note! Once this unit is linked with your vehicle it is married to the car by the VIN Number. While you can use it over and over again on your vehicle if needed after a dealer visit, but you cannot use it on another vehicle. Trying to sync it with another vehicle once you paired it with your vehicle can do damage to the item and the ECU in the car. Due to the way the unit is designed to work it cannot be used on another vehicle once it is paired with yours. Due to this we cannot accept returns for this item in any way. We have no way to tell if the unit was paired or not with a vehicle and if it is returned we cannot use it again. Because of this all sales are final on this unit once you purchase it. There are no returns or exchanges of any kind and all sales are final. Please be sure to ask any questions prior to ordering. Once shipped there are no refunds or exchanges." Soooo you are charging $500 for software (which costs 0 dollars to duplicate an unlimited number of times) that has some primitive DRM limitations, and claiming that as a basis to not accept returns? What if you have a 6 speed? Will it be in the form of nanobots or will a Madness representative train me to shift more efficiently? Actually in the tuning world this is a very common practice when you're dealing with a flash via the OBDII port. As mentioned in your post this product is indeed "married" to your vehicle meaning that you cannot take that AutoFlash and try to load this software onto friends car. Unfortunately it doesn't work like that. Now if you're in the market for something that is more universal and comes with a RISK FREE return policy then the MADNESS GoPedal or MAXPower ECM would be some perfect examples for you to check out! As feedback and reviews has shown this product has been gaining popularity. Not only in this community but also with the numerous other makes and models we support. Trust me, will this product be for everyone? Of course not. That's why it's our job to do our best to educated the consumer as much as possible to ensure before purchasing that this is the best fit for your vehicle! If you happen to have any other questions in regards to this product or anything else please feel free to contact us here at the shop 562-981-6800 and we'll be more than happy to assist you! Before I make any suggestions, do you have the 1.4T or the 2.4? [QUOTE=MADNESS Autoworks;559842]Before I make any suggestions, do you have the 1.4T or the 2.4? I have the 2.4. My biggest problem is trying to accelerate in freeway traffic, pressing the pedal down and then waiting 2 seconds for the transmission to actually downshift and get me accelerating. I suggest trying the GOPedal first to see if it does what you want it to do, which is decrease the lag time it takes to downshift. The reason I suggest the GOPedal is because it comes with a 30 day money back guarantee in case you are not happy with it. Keep in mind though that the AutoFlash and the GOPedal go hand in hand. The GOPedal improves your throttle response, and the AutoFlash updates the maps of the TCU to allow the gearbox to improve shift times and bypass the torque limiter.